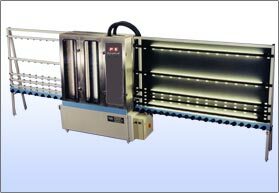 The Six Brush is a three stage veritcal glass washing machine designed to constantly cope with the most rigorous of glass washing schedules. Completely isolated prewash containing it's own hot water tank and set of rotary brushes for removal of particulates prior to entering the main wash. Contains two pairs of rotary brushes revolving in opposite directions washing and polishing the glass with hot water. Final rinse with hot water of a very high standard, passing through a fine filter prior to glass saturation. Three stage wash: 2 brush prewash, 4 brush main wash, rinse. Three separate water tanks containing 250 litres for dilution. Running speed variable 0-10 metres/min, brush speed proportional. Air blowers: Choice of hot or cold, switch operated. Open plan, easy maintenance design. Inspection screens allow viewing all three wash stages. Suitable for all types of specialist coated glass. Minimum glass size 190mm x 100mm. Conveyorised outfeed rack with stop/overide and inspection lights. Low water safety switches with visual warning. Available left to right or right to left.